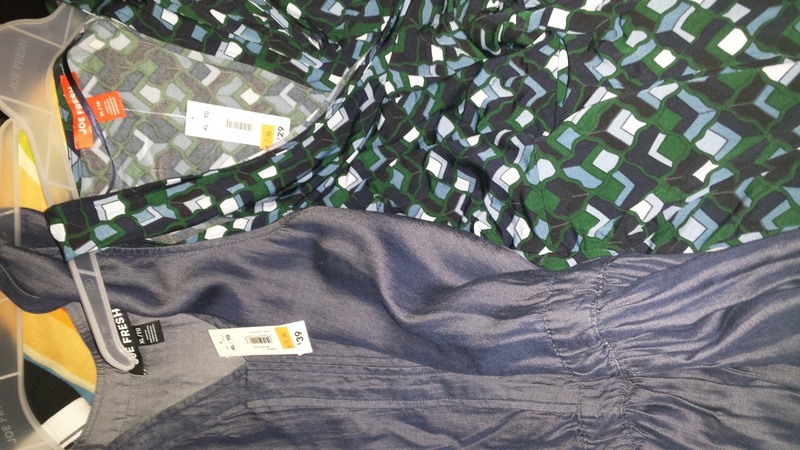 Went to Walmart the following Tuesday and bought a top for $5 (reg $9.97 and 2 pants for son $5 ea (reg $11.97 & $12.97). On Wednesday after going to son's school re progress report, we went to Fortinos to get few items. I browsed the clothing depth and ended up buying 2 dresses for myself (guess they were meant for me as they were the last ones in my size ;sleeveless v-neck light denim rpaid $9.94 (reg $39) & a multiprint sleeveless v neck $7.94 (reg ($29)...did my happy dance and hope this luck continues with Christmas shopping. Last edited by Shirnette; Sat, Nov 11th, 2017 at 06:41 AM. Tweets77, Ciel, cath007 and 3 others like this. oh shirnette you are on a roll -I love talize also but I couldn't make the 50% off - I love love thrift shopping-great deals all around for your family-my daughter has that joe fresh green patterned dress ,its so cute on . Ciel and Shirnette like this. Now, you can buy most trendy clothes art cheapest price through online store or website. Why did I not sign up for Talize updates? Did it just now so I know when the big sales occur. Thanks for sharing your shopping deals! Which brand it is? The price is quite reasonable.